Dadi Automobile Group Co., Ltd. - a small Chinese company for the production of cars. Initially it was an enterprise of the military-industrial complex. Since 1988, the production of civilian vehicles has been established. 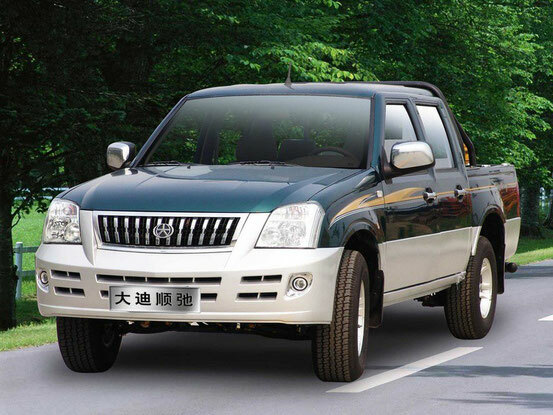 Despite the fact that in general the volume of production by Chinese standards is small, it is one of the leaders in the production of pick-up trucks and SUVs in China. The company's production facilities are concentrated in the industrial zone of Dingxing, Baoding, Hebei Province. All production of the company is divided into 4 main areas: cars, construction equipment, pick-ups and SUVs, military products. In 2005, the volume of production amounted to 7506 vehicles. In 2008 the company created a new brand GROZ. Under this brand is the production of SUVs and pickups, among which the most famous are the models of GROZ Rocky, Shuttle, Targe, Fox, Dakota, Bliss, Vertus. GROZ's products are the improved equipment of cars manufactured by Dadi. Advanced models are sold at higher prices due to the best quality of bodywork and the use of expensive materials in the interior trim. Dadi Shuttle - The model is produced since January 2005 and is a mid-size SUV superficially reminiscent of the Toyota Land Cruiser Prado. Frame construction, longitudinal arrangement of the engine, drive rear or forcibly connected full. Overall dimensions: 4870х1785х1850 mm. Dadi City Leading - Produced from September 2004. The mid-sized SUV. Frame construction, longitudinal arrangement of the engine, drive rear or forcibly connected full. Overall dimensions: 5060х1780х1860 mm. Dadi City Steed - Production since 2006.